Service on the Astoria route will start Aug. 29, officials said Wednesday. LONG ISLAND CITY — Service on the Astoria ferry route will start running Aug. 29, Mayor Bill de Blasio announced — the latest line to launch on the city-subsidized NYC Ferry system, which hit the 1 million rider mark Wednesday, officials said. The new route will connect riders from the Hallets Point peninsula in Astoria to Roosevelt Island before heading to a new ferry landing in Long Island City, East 34th Street in Manhattan and Wall Street during a ride that takes approximately 38 minutes. It will be the fourth route on the NYC Ferry system, which has served 1 million riders since its launch May 1 — a milestone officials said came about a month earlier than the city initially projected. Rides on the system cost $2.75. The Astoria line will follow the launch of the Rockaway route, which started in May, and the South Brooklyn line that began running in June. 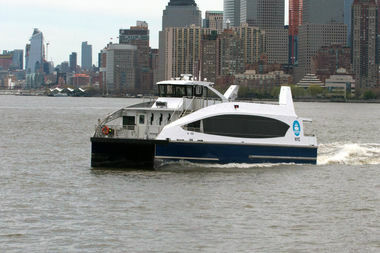 The existing East River route transitioned to new operator Hornblower on May 1, and new routes serving the Lower East Side and The Bronx are scheduled to launch next year. Ridership on the system "has immediately and far exceeded what we projected," de Blasio said, noting that the city had initially anticipated hitting the 1 million rider mark on Aug. 23. As of Wednesday, more than 625,000 people had ridden the East River route, 221,000 riders had used the Rockaway line, and 154,000 people had taken the South Brooklyn route, officials said. The three lines have seen an average weekday ridership ranging between 8,000 and 12,000 passengers, according to the city. Demand for the ferry has led to complaints from riders about less reliable service on the East River route, as well as long lines for beach-goers using the Rockaway route. "We know there’s been some challenges," de Blasio said Wednesday. "The blessing is a lot of people like it. The challenge is a lot of people have shown up — more than expected." To accommodate the crowds, the city will expand capacity on three of its 20 boats starting next year, the mayor said. The larger vessels, set to arrive in 2018, will have bigger engines and be able to fit up to 249 people, compared to 149 on the standard ferries, officials said. "It's going to help us address demand and we're going to keep building the system," de Blasio said. "This is all about creating more access around the city." The launch of the Astoria route next month is also expected to ease crowds on some of the other lines, the mayor added. Its addition will mean the opening of a second ferry landing in Long Island City, located at the northern end of Gantry Plaza State Park, which will likely help alleviate demand for the East River line. The Astoria ferry landing will be located next to the Astoria Houses near Hallets Cove Playground, off of Vernon Boulevard between Welling Court and 30th Road, where the nearest subway station is about a 20-minute walk away. "[It's] much too far of a walk for our older residents," said Claudia Coger, head of the tenants association at the Astoria Houses, where she's lived for more than 60 years. "As long as I've lived in Astoria Houses, our community has been cut off from so much of the city," she said. "NYC ferry is going to change all of that. The Astoria landing will be just a short walk from our front doors."